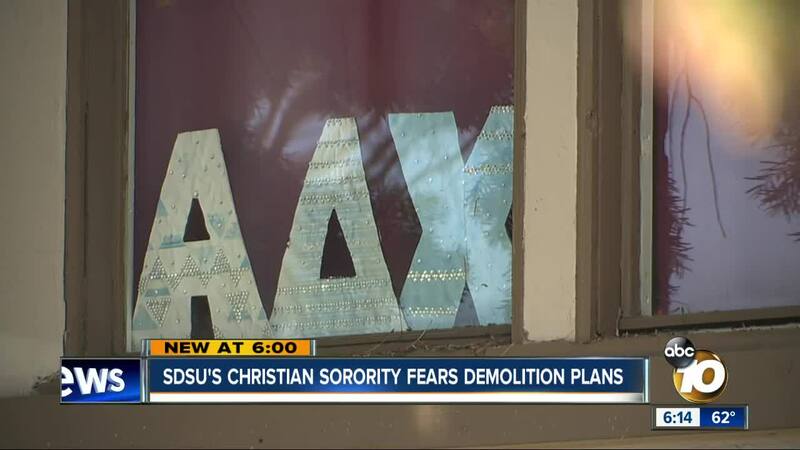 SAN DIEGO (KGTV) – San Diego State University is going to lose its one and only Christian sorority house. Builders plan to tear it down and put up more housing for students. Alpha Delta Chi sorority sister Madison Zeber walked us through the halls of the sorority house near campus, where 15 women live. The walls are covered with old, handwritten messages of faith. On the outside of the house, there’s a new message. A notice was recently posted by the City of San Diego, of plans to close the only Christian sorority. A private party plans to replace it with 42 units of new housing, intended for students. A neighboring single-family home and fraternity house will also be lost. The SDSU Research Foundation owns and leases the houses, and tells 10News that the development plans were announced last fall. The sisters won't have to vacate the sorority house until 2020, when their lease is up. “We're trying to fight for this and take it one step at a time,” says the sorority president Alexis Kojo. Alpha Delta Chi’s lot will not be used for Sophomore Success Program, but that doesn't change much for these sisters. No matter what, they'll have to start packing. “Our way of connecting to the school would be gone. Our sense of identity as Christians on this campus [and] SDSU students would be kind of taken away,” adds Kojo. The sorority says there are public meetings to discuss the redevelopment plans. The sisters say the meetings will take place April 3 and April 10 at the nearby Faith Presbyterian Church.